This Springerle board belongs to my mother-in-law, Frieda Schmidt Traetow. It originally belonged to her mother who came to the United States with her parents from Winterbach, Germany near Stuttgart. Frieda?s mother?s maiden name was Marie Steinbronn. Marie and her family had tickets to sail to the United States in 1912 on the Titanic. However before their departure from Germany Marie?s eye glasses broke. The family wanted to have Marie?s glasses fixed before sailing to the United States. Because of this they were forced to cancel their tickets on the Titanic and instead sailed at later date on the George Washington. This, of course, turned out to be a blessing as Marie?s family?s life was sparred because of her misfortune with her glasses. It is interesting to think about how precious the Springerle board must have been to Marie?s family. They would have had to make room in their trunks when coming to the United States for the board. 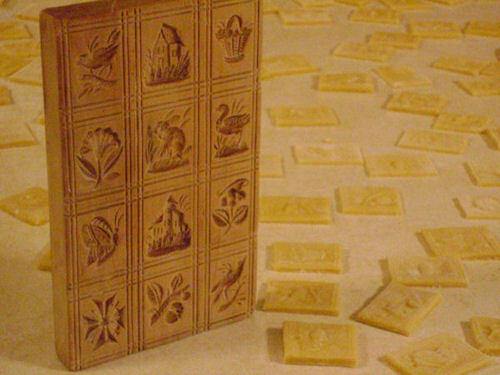 The board is wooden and obviously hand carved. 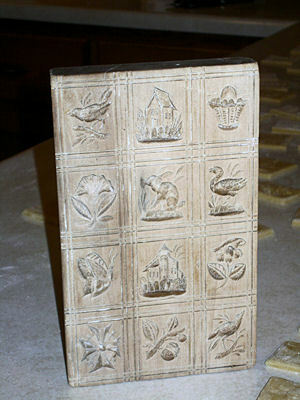 There are carved images in the board of birds, flowers, a church, a cross, a basket, a home, a swan, and a rabbit. After Marie?s parents died the board was handed down to her and when Marie, Frieda?s mother died, it was handed down to Frieda. Frieda had many siblings. Frieda is now 86 years old and has done a lot of baking all of her life which started when she needed to cook for all of her younger brothers and sisters. She is an excellent baker; perhaps this is why the board was given to her. Frieda typically bakes the Springerle a week or so after Christmas. I borrowed her board this year and baked my Springerle early in December because I wanted to hang them on our Christmas tree. I used a straw to drill a hole in the top of the cookie before I let them harden and bake. After I baked them I sprayed them with a varnish spray and sprinkled them with a snow dust. (The cookies are not edible but decorative - I hope to be able to use them again next year on our tree). I was very, very careful with the board because I know how precious the board is to Frieda and her family.